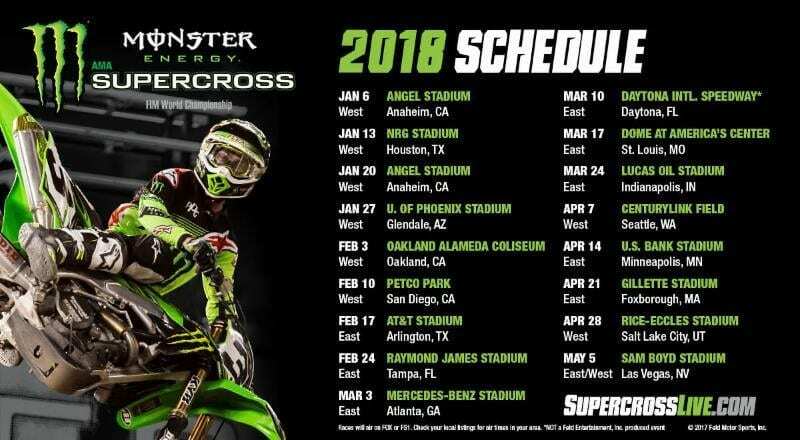 This morning, Feld Entertainment announced the 2018 Monster Energy Supercross schedule. Gone from the 2017 tour are New Jersey, Detroit, and Toronto and added are a return trip to Houston and Boston (Foxborough) as well as a new stop in Tampa. While I’m glad that the New England round returns, I’m going to miss the short drive to Met Life for Supercross. The addition of the Tampa round is intriguing, supercross has never done very well there but with the Feld Entertainment office just up the road, I guess it makes sense. Plus, the teams will have a nice couple of weeks in the southeast for Tampa, Atlanta and Daytona. That should help with the truck drivers schedule. Take a look at the schedule below and the Feld Entertainment press release. ELLENTON, Fla.– Feld Entertainment® announced today the 17-race schedule for the 2018 Monster Energy AMA Supercross, an FIM World Championship, season beginning January 6 at Angel Stadium in Anaheim, Calif. Headlining the 2018 changes are three new markets for motorsports fans to witness the premier off-road motorcycle racing championship in the world. The 2018 schedule provides greater access with eight races in the Mountain or West Coast time zones and nine in the Central or East Coast. Destinations include a return to Foxborough after a one-year hiatus and a visit back to Houston, last event in 2015. The brand-new Super Bowl-sized Mercedes-Benz Stadium in Atlanta will be one of the premier races as the series swings through the Southeast and also stops in Tampa for the first time since 1999. This change will be a highlight as Florida is now home to many of the top Supercross athletes including Chad Reed, Marvin Musquin, Jason Anderson, Zach Osborne, and Malcolm Stewart. “The athletes of Monster Energy AMA Supercross, an FIM World Championship, are among the most skilled and talented in the world and this schedule provides a worthy showcase for what certainly will be another season of stellar racing,” said AMA President and CEO Rob Dingman. “As we saw in the recently wrapped up 2017 season, the race for the coveted 2018 AMA Supercross No. 1 plate will begin in Anaheim and most likely extend through the finale in Las Vegas. We are pleased to continue to partner with Feld Entertainment on bringing the most exciting indoor motorsport on the planet to race fans, as well as the AMA amateur racers across America who hope to one day line up for an AMA Supercross Main Event.” The unparalleled fan experience of Monster Energy Supercross isn’t over for 2017 just yet. Fans can expect an epic battle among the sport’s top competitors at the Monster Energy Cup on October 14 at Sam Boyd Stadium in Las Vegas where racers compete for the largest purse in motorcycle racing, a $1 million payout. Tickets for the 2018 Monster Energy Supercross season will go on sale Tuesday, October 24, 2017.